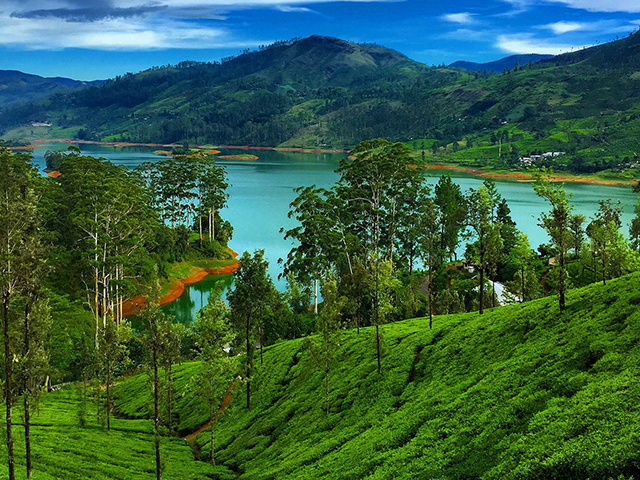 ➤ After breakfast proceed to Nuwara Eliya, The Little England of Sri Lanka, which is set against beautiful backdrops of Mountains, Valleys, Waterfalls and Tea Plantations. ➤ It is supposed to be one of the coolest place in Sri Lanka, but it is really just like an English spring day, although the temperature does drop at night. ➤ All around Nuwara Eliya you will see evidence of the British influence, houses like country cottages or Queen Ann style mansions. The Victoria Park, in the middle of the town, is a lovely place for a stroll or a picnic and is also good for Birding as you get some rare birds in this Park. ➤ Enjoy the Ceylon Tea Experience which involves a visit to A plantation to observe firsthand the process. Starting from the plucking field where it all begins with the picking of "two leaves and a bud" to the factory where the processing begins. Originally introduced to the island around 1850 by the British, Ceylon Tea is world famous for its high quality and has remained a major contributor to the island's economy for generations. Currently, Sri Lanka is one of largest exporter of tea worldwide. ➤ After Lunch at Restaurant, proceed on a City Tour of Nuwara Eliya. Misty steep roads, twisting through lush green blankets of tea bushes in a cool climate, remind visitors that they are within the range of the renowned British colonial retreat. Augmented by an English countryside atmosphere, this city was once governed by the English & Scottish planters and is still studded with colonial bungalows, hedgerows & one of the finest 18-hole golf courses in the world. ➤ A hike through the green grass and red-brick walls should present breathtaking views of a buzzing countryside hamlet. ➤ Drive through green valleys of the hill country pierced by endless waterfalls & dotted by tea pluckers draped in bright-colored saris. ➤ You can also go on a boat ride or just rent a bike for a gentle ride along the banks splashed by the waters of Lake Gregory. ➤ You can also visit the epic Seetha Amman Temple. She is said to have bathed in this stream and it is believed that Lord Hanuman the monkey God had visited Seethadevi here. Now there is temple for Lord Rama, Sitadevi, Luxshmana, and Hanuman by the side of this stream. It is interesting to note that foot prints akin to Lord Hanuman's are found by this river. ➤ Dinner & Overnight stay at hotel. ➤ After breakfast proceed to Kataragama, visit the Rawana Ella Cave. This cave is in the huge Ella Rock. Hanuman the monkey god, is said to have climbed up Ella Rock, in order to find Seetha in the cave. Seetha lived in this Cave for some time. ➤ Proceed to the south west of Sri Lanka, to the City of Kataragama, a popular pilgrimage destination frequented by adherents of all religions in Sri Lanka. This is also the place close to the YALA National Park. ➤ After Breakfast leave for Weligama, known for its stilt-fishermen, whose unique style of fishing involves casting their lines from a perch on a sturdy pole 20-50 meters out to sea. This unique method of fishing is highly photogenic. ➤ Afternoon proceed on a discovery tour of Galle, Once Chief Port of Ceylon. This is town rich in history and was the center of the Dutch regime in the 17th century and the majestic Galle Fort ( spanning 90 acres ) bears testimony to this fact. The city of Galle is one of the well preserved colonial-era cities in Southeast Asia and has been declared a 'World Heritage Site'. The Dutch museum & the Dutch church are two famous tourist attractions in Galle. ➤ The city is also known for its delicate handmade lace and ebony carvings.